ANSI Accredited Program. 100% money back on the purchase price if returned within 30 days of enrollment, and if no more than lesson one has been studied. If you have any questions or comments on our return policy/terms of purchase, please feel free to contact us at 888-826-5222. Courses are purchased as single-use enrollments. Each lesson allows up to 5 reviews. After 5 reviews the lesson is closed. Courses are active for 6-months from the date of enrollment and will stop functioning on the 6-month anniversary date of the enrollment. Course and examination take approximately 1.5-2 hours to complete and, upon successful completion, provides a printable handler certificate and card. The card is valid for three years. If you work in Riverside or San Bernardino County, contact the county environmental health department before taking this course. Where can I get assistance or support? 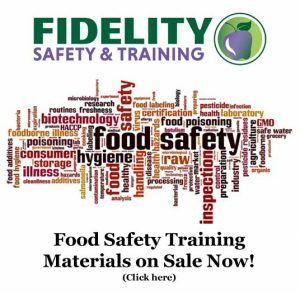 How do I enroll a group of employees that need their food handler card? You can pay for up to 999 employees at one time. However, if you have more than 40 employees, please contact us at 800-429-7110 for a discount before you register/pay. Is the training only available online? Yes, for $9.95. However, a two-hour classroom version is available in CA for $35 to $50 per person depending on the number of employees and location. Major credit card, debit card with Visa/Master Card logo or checking account. What language is the course and exam? I lost my certificate, how do I get a replacement? How long will I have to complete the course and exam? Courses are purchased as single-use enrollments. Each lesson allows up to five exam attempts. If you do not pass the exam after five attempts lesson is closed. Courses are active for six months from the date of enrollment and will stop functioning on the six-month anniversary date of the enrollment.